Thermo King Triad line of Air Intake Cleaners from Sy-Klone, allow for added horsepower, torque and air filter life and have a positive impact on vehicle efficiency, power, acceleration and maintenance. The air flow that goes into the engine is controlled by the air intake system. For increased power and speed, the engine must get the proper air flow. Our line of Air Intake Cleaners remove dirt before it gets to the air filter. From noise, to sticking parts, to slower acceleration, having a dirty air intake can dramatically affect the efficiency of one’s vehicle. The technologically advanced air intake cleaners that Thermo King Triad provides do not allow for dirt, dust, and contamination to rob your equipment of efficiency or your company’s profitability. Includes Precleaner and clamp. Please check the Series 9000 Sizing Wizard to confirm that you are ordering the correct model precleaner, as precleaner size is determined by airflow requirements, not your machine’s air inlet size. The Sizing Wizard will also specify whether or not your machine will need an installation kit. Air filter life is directly related to the amount of debris ingested through an engine’s air intake. 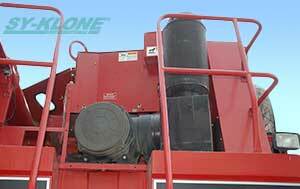 Installing a Sy-Klone Series 9000® Air Precleaner as the first stage of an air intake system prevents the majority of heavier-than-air particles from entering the system. This results in longer air filter life, more efficient engine performance and decreased maintenance expenses. See how much YOU can save by using the online Series 9000 Savings Calculator. Tired of dusting your engines due to poor filter maintenance practices? Are on the job air filter changes contaminating your oil samples? Sy-Klone® International now offers the XLR™ Powered Precleaner™ for maximum precleaning in impossible environments with the lowest possible restriction to protect your engine! This high efficiency powered precleaner removes 99.99% of ISO fine test dust. With the addition of power, there is zero restriction up to 130 CFM (3.68 m3/min). OPTIMAX® is more effective at removing mixed and extreme debris than any other precleaner in the world. Are you protecting the most vital part of YOUR investment? Your engine deserves a precleaner without peer, one that will protect and defend it from all of the enemies in the air. 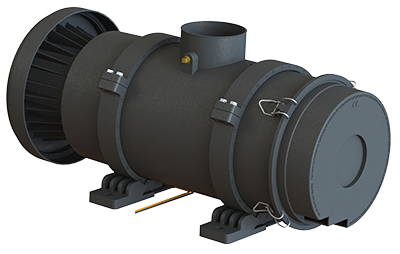 Air Flow Range: Covers engine air flows from 350 to 1,400 CFM (and much higher with multiple unit installations, contact Sy-Klone for assistance). Mounting: Requires engine exhaust scavenging connection. Precleaner Maintenance: Stage one, the Series 9000® Precleaner, is self-cleaning and maintenance-free. The second stage requires minimal maintenance as the chamber is completely open and there are no narrow openings to become plugged. The cover is removable and is easily accessible for inspection and cleaning (if necessary). Recommended Uses: Agriculture, Waste, Mining, and Forestry. When you need more than the Series 9000® Precleaner and have a scavenger connection, the OPTIMAX® removes mixed and extreme debris.